They’re the ones with the illustration of a Model S done in pickup with a tandem axle. They think the Model U will top north of $120,000 MRP. A truck with a unibody design, second since Honda Ridgeline. The base model should use a 75D drivetrain, which is currently capable of delivering up to 328 horsepower and 387 lb-ft of torque. This option should get a smaller 120 kWh battery, which is going to enable around 240 miles of driving on a single charge. The mid-range Tesla Pickup Truck will use a 90D drivetrain system with 417 horsepower and 485 pound-feet of torque, while the range-topping Model U should use the impressive P90D system that’s going to produce 532 horsepower and 713 lb-ft of twist. Both the 90D and P90D mills will be mated to a 160 kWh battery pack and both should be able to cross around 400 miles on a single charge. The first estimations say that the top-of-the-line Tesla Pickup Truck should be able for a towing capacity of 10,000 pounds, while the unloaded vehicle might easily get a 0-60 sprint below 5.0 seconds. This is what Inside EVs had to say about their version of the U with a friend who helped them render this rendition of the truck, the one that looks very Ram-like in white. The hood has a large frunk area and a large front liftgate. What I´m afraid we have more here is more Ram than Tesla. This would make an excellent Ram electric. I don´t think necessarily a Tesla. Nice attempt though. I’d give this to FCA. My colleague Frederic Lambert over at Electrek got his end of the Tesla community thinking of Model U in the rendering above that has Tesla turbine wheels and Ridgeline like reinforcements on top of the bed. Frederic found a reddit user who made a rendering of the Semi style that fits into Elon’s Easter Egg profile. Reddit profiler u/LukeTospace has Model U back to class 8 instead of class 2 or 3 light duty pickup. •	It’s going to be a big truck. ◦	Musk said that it will feature a step that will lower to step into the truck and he said that Andre the Giant will be able to fit in the driver’s seat. •	The Tesla Truck is going to be a 6-seater. ◦	Musk previously said that platforms like the Model S and Model X would probably be capped at 125 kWh of energy capacity, but he said that the truck platform will offer an opportunity for a much bigger battery pack. •	Dual Motor All-wheel-drive powertrain with dynamic suspension will be standard on the truck. •	The truck will have a 240-volt connection for heavy-duty tools and even an air compressor to run air tools. ◦	the second part was a suggestion that Musk liked since the truck will already have a pneumatic system for the air suspension. •	‘300,000 lbs of towing capacity’. ◦	That’s another tweet where you have to ask yourself ‘is he kidding?’, but he is most often not. Though I’d bet the actual rated capacity is going to be much lower and like the Model X, owners will be able to push the truck further. •	It will be able to float. ◦	Musk referenced how the Model S is able to, but that’s up to a certain degree and it’s obviously not recommended. •	The Tesla Truck will have lockers. •	Musk said that ‘it will look like a truck’. ◦	I take this as he is not planning an overly different design because it’s electric. He mentioned that he likes the design of the old Bronco. I make no bones that my favorite rendering is from Truck Trends and I use it often as a reference. That’s the red truck images you see. The target vehicle Tesla should be aiming for is NOT the Honda Ridgeline. I don’t know where that silly net sourced talk came from. The target vehicle should be the Ford F-Series vehicles. The direct competition should be Rivian and Range Rover/Land Rover Discovery. Everything a Rivian is and does is what a Tesla should also have and be doing. This includes insane torque and horsepower and quad motors. It should have at maximum at least 400 miles of range. Do not put just a 15” or 17” screen on the dash Model 3 style. Also put dash instrumentation like both gas and electric versions have. This is not the time to go one screen like Model 3 in this segment. You can do that in a refresh preferably a next gen. Make the inside look no different than Model S.
It should have a large frunk, and preferably a frontgate. Multiple power ports for devices/tools, ability to juice up other BEVs, and to plug itself into a home as a power source. Severe terrain capable on the fly 4x4 and not just AWD. This includes ascent/descent control and military grade angles: it should be a real Jeep/Land Rover Discovery killer. Almost completely submersible in water since it has no tailpipe. Tow rated at least 10,000 lbs. GVWR. Base interior ability to hose down with a garden hose. Connelly hides for top interior. Like Bollinger and Rivian there should be a Range Rover killing SUV variant apart from Model X. It should be a serious top of the line/top of the range 2 and 4 door all terrain SUV not a CUV. There should also be to come even later after the SWB SUV a Tesla Model U SVA Autobiography LWB 4 Door SUV to compete with RR and Bentley. Regardless of what the truck will look like, and what may come for Model U, its unveil is scheduled sometime later this year in about nine months from now. If Model Y is scheduled as a 2021 for Fall of 2020, I say expect Model U to be a 2022 with production starting around mid-2021. All this in “Tesla time.” If this was “GM time” that would mean light years from now if ever. As far as price point: the Model X starts around $79,500. I say that’s a good price point to start for a luxury truck like Model U. I could be wrong. So instead of us all arguing about all of this, why don’t we all just wait and see what happens? 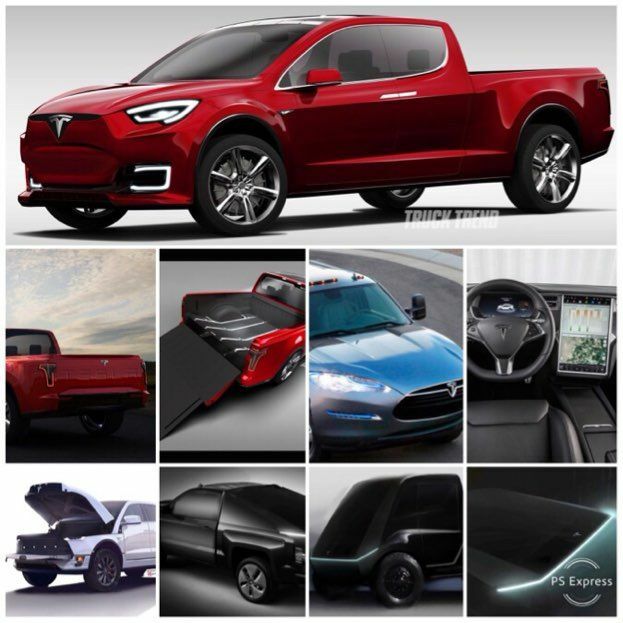 Photos: the Ram Tesla is from insideevs.com, the Ridgeline Tesla is from Reddit profiler u/LukeTospace, the Model S Pickup is from 2018 Pickup Trucks website, the red one is from Truck Trends, and the teaser from Tesla Media. These images appear online in competing publications such as Electrek, Inside EVs, and from sources like the Tesla Y unveil broadcast. I use them here with or without their permission as these images are now part of the news making national discussion on Tesla Model U. This makes them newsworthy. So all images are published here and all under Section 107 of the Copyright Act 1976, allowance is made for "fair use" for purposes such as criticism, comment, and news reporting. UPDATED NOTICE: I am so grateful that my publisher allows me the generous privilege within reason to either report the news or express my opinions about matters related to the auto industry. I try to be judicious and respectful about the content. I ask you do the same in the comments section by refraining from inappropriate language and content. Please be nice, there’s no reason to get nasty, this is only about cars. The irony is if you came up on me on the street to recognize me I’d grab a beer or coffee with you and we’d talk about cars for me to thank you for being a reader! I may disagree but I truly do love you all, I’d take a bullet for many of you. And please keep in mind that the opinions expressed here are solely mine, and not those of Hareyan Publishing or its employees, including my staff colleagues. What do you think of Tesla Model U? Please let us know below! The Model Y, virtually indistinguishable from its 75% in common Model 3 is a big flop. I can't even distinguish one from the other, except for the stupid caved in side panels on the uglier Model Y. Biggest lie of all was calling this vehice an SUV. Yeah, and I'm Napoleon wrote one blogger. Thanks for the comment. Kent I live in the LA area and today I was driving around Tesla design studio territory to see a Tesla that wasn’t quite as big as an X and bigger than 3 to wonder if that was a proto Y. Or wasn’t it? Go figure. The Model Y is a crossover, and just like the crossovers from a dozen other automakers it is mostly a taller version of a sedan. No surprises here. It's like the body design differences between the Volt and the Bolt. For the Model U there has been such contradicting information on the design I wonder if it will be like the Rivian, or a scaled down version of the Tesla Semi. I am hoping that it looks like the stylish renderings above, and importantly I hope that they make a formal announcement soon, even if it takes a few years to get them on the road. The model Y is hardly yesterday's news because it is not even released and able to drive yet. For people who wanted a Tesla, but wanted more space AND a lower price than the Model X, this will be a good fit. Seeing how there are only a tiny handful of EV crossovers available to buy today, and none yet that offer 65+ cu ft of internal storage for under $50K, there are a lot of potential buyers out there. For the Model U, the top selling Chevy and Ford Pickups show that MANY people are willing to spend $40K-$80K for a full sized pickup, and the Rivian has shown that many of those buyers are excited about an EV pickup, even if it isn't cheap to buy. Tesla just needs to translate their BEV expertise into the reality of a competitive, full sized pickup, and soon. Rivian has clearly accelerated Ford, Chevy, and Dodge's timetable for a BEV pickup, and most likely Tesla's Model U will raise the stakes even more. I do expect to see hybrid (PHEV) pickups (not just mild hybrids) in the next 1-2 years, but Tesla needs to beat Ford and GM (who could adapt a BEV drivetrain to an existing truck this year if they wanted to) to market. Spot on Dean. We are in agreement that hybrids make great range extenders for trucks, especially for 4x4 trailing and camping where the next refueling station can be light years away. We may disagree that there is no more use for them for passenger vehicles, ionization is now cheap with no excuses. I’ll leave it there. Nice analysis.